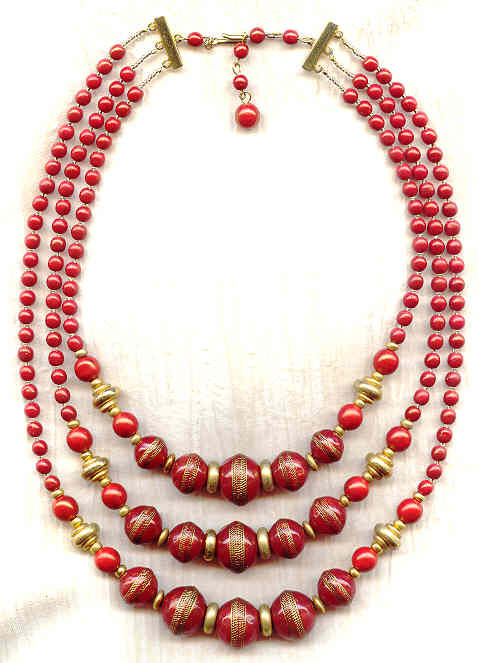 The large beads in this three-strand extravaganza are made of acrylic, a thermoset plastic of which Lucite (a trademark of the DuPont Company) is perhaps the best-known example. These beads were moulded in West Germany in the mid-1950s, at a place and time that acrylic manufacture was at its zenith. The latticed golden banding against the deep red colour of the beads reminded me of things that were found in archeological digs in the Mediterranean, hence the name of the piece. The largest of the acrylic beads is about 18mm in diameter. The clever hook-and-extender closure gives the necklace a working length of from 18 to 20 inches, measuring the shortest strand. It's a pleasure to look at, it's comfortable to wear, and it's affordable; must be from SPARKLE PLENTY.